Welcome to our template design gallery. Select any of the templates below to start editing. You can then print using your own personal printer. 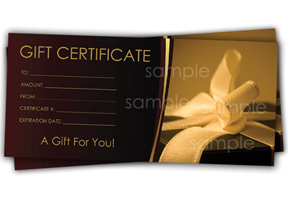 Our printable gift certificate design templates can be easily personalized with your company name and information. Highlight the fields that you want to edit and replace with the information you want on your certificate. Or you can also print them blank and fill them out as you go. All certificates feature high quality photography.